Phinn is an unstoppable tank who brings the fight to him. He pairs incredibly well with other heroes who don't back down from battle. 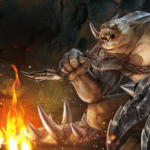 Phinn is strongest with defense and utility items, and he's able to absorb immense amounts of punishment, protecting teammates while they dish out damage. Phinn cannot be stopped. All stuns and movement-impairing effects are instead reduced to moderate slows. He even shrugs off most damage through passively gaining additional armor, shield and max health from items and effects. Phinn slams his anchor down on a neighboring location, heavily slowing enemies. Overdrive: This upgrades the slow into a stun! 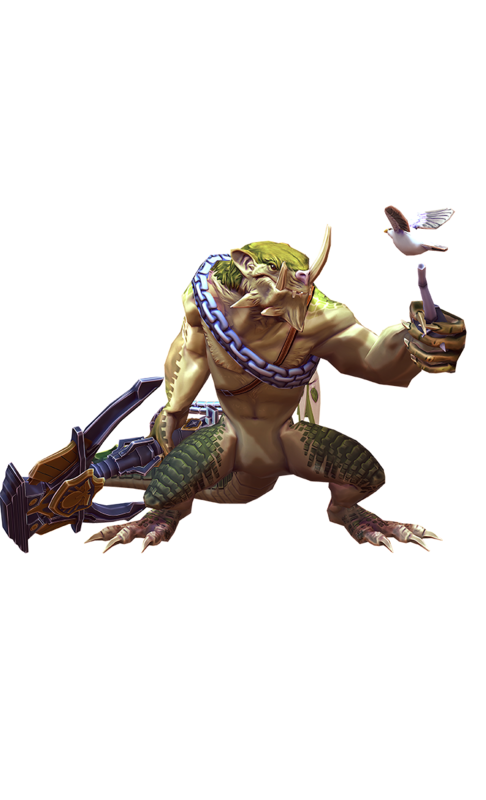 Phinn stomps the earth, dealing crystal damage to all enemies in a wide area and launching them toward him. The effect reverberates around allies, granting them a barrier along with bonus armor and shield for the next few seconds. Overdrive: Makes enemies travel farther toward Phinn upon stomp. 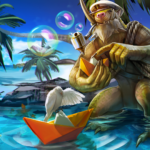 Phinn throws his anchor in a direction. After the anchor reaches its destination he yanks it back, damaging all enemies in its path and pulling them back to him. 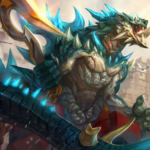 If Phinn doesn't pull any enemies, a percentage of the cooldown is refunded. The balcony gave a disconcerting creak under Phinn’s clawed bulk. Blackfeather drew his sword before bursting through the door to Princess Malene’s silken-pillowed, antique-furnished, monogrammed-everything room. The princess sat on a mahogany curule chair, her gown poofed over its sides, peering at her pretty young face in a silver mirror. The mirror reflected no shock when her abductor entered, though one of her eyebrows rose to a judgmental point when Blackfeather tore the rose from his teeth. With a grand leap, Blackfeather slapped his palm over Princess Malene’s mouth as Phinn bent double to fit himself through the balcony door. “Are we having a giggle or a kidnapping, then?” Phinn grumbled. “And the handsomer,” muttered the princess, who tried to swish away from Blackfeather and was deterred by his blade at her throat. Phinn stomped in his slow way to a gilded birdcage, inside of which perched a small white bird. “That’s a rare bird. Is it a Trostanian White?” he said, then whistled through the fork in his tongue. “Pretty thing. Shouldn’t be in a cage. What’s its name?” Phinn unlatched the cage door with surprising dexterity and the bird hopped onto his head. The boys looked at one another, then back at her. “No use resisting,” said Blackfeather, quieter this time. “It’s almost as if you have ordered this enterprise done yourself,” complained Blackfeather. “Seems fair,” said Phinn as he jerked on the chain, pulling the anchor loose along with much of the balcony railing. The roar of engines and barking dogs in the near distance sent the three running through the maze without further conversation. “Can’t dance to a song about kidnapping,” replied Phinn. He scratched deep into his ear with a single long claw. The two ne’er-do-wells huddled in a dead end of the thorned Hardy Orange maze under the balcony. Phinn towered over the tallest thorny bush. “I hear her parents are nice people, far as royalty goes.” Phinn cared little for matters of adventure, having been alive a good long time and seen a good many things. He thought it healthiest to avoid drama. “There, then, is your reason. For in the hostelry where last night we lodged, I heard there is a considerable bounty out for the princess whose chamber turret I took the responsibility of scouting this afternoon during your second nap.” Blackfeather pointed up. “Would this do?” And with that, Phinn pulled from his back an anchor. 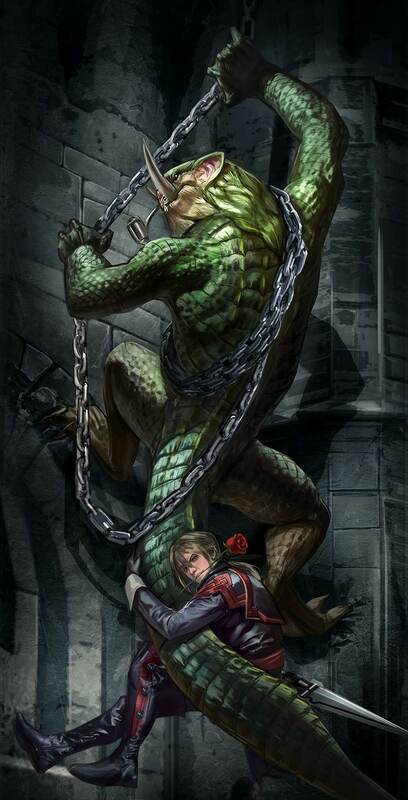 Blackfeather added an exaggerated head tilt to his eye roll so that it would be apparent in the darkness, and within minutes, the chained anchor sailed from Phinn’s hand to the balcony, locking into place with a great, satisfying, safety-inspiring ch-ch-CHOCK. Phinn and Blackfeather began their ascent.